Find out about the community. Get details on real estate in Crystal Falls, including neighborhoods, Crystal Falls homes for sale, golf amenities and more, with our unique, lifestyle-based map search. Contact an area expert at Farrington Realty for more info. Crystal Falls, Texas consists of an exclusive, golf community and popular home market in Leander, Texas real estate. The community covers about 5,000 acres in the heart of pristine, Texas Hill Country. As a result, Crystal Falls includes a spread out, countryside feel. Real estate in Crystal Falls includes a delightful spread of master-planned neighborhoods and luxury homes, many beside lush golf course greens. Real estate includes parks, play areas, trails and an abundance of other recreational facilities. Homes include established and new choices with plenty of quality, style and living space. 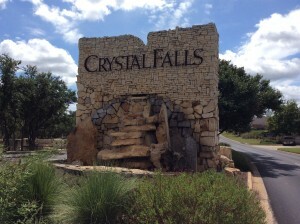 Crystal Falls has a upscale, yet relaxed and highly family-friendly profile. It seems to capture the essence of a perfect blend of the western and golf resort lifestyles, with a modern accent. It has a number of unique features like the stockade fences made of cedar stays and hand carved, limestone street signs. Several neighborhoods each come with their own unique brands of livability. These include gated, hill country homes sites with acreage in Grand Mesa. The Highlands offers real estate brimming with family-friendly amenities. The Fairways or Cap Rock neighborhoods showcase real estate in Crystal Falls providing incredible views of Golf Club at Crystal Falls. In addition to golf, tennis, swimming, parks and top-rated schools complete an idyllic picture of high quality living, working and playing. Grand Mesa has custom home sites of 1 – 3 acres. The perfect, stick built home can be purchased with these home sites, starting at about $500k and peeking around $1 million plus. In The Fairways, homes for sale start at around $300k. Cap Rock presents Crystal Falls homes for sale starting at around the same price. Each of the neighborhoods in Crystal Falls present delightful features in real estate, all their own. They come complete with a gorgeous back drop of hill country scenes and Crystal Falls Golf Course greens. Anyone interested in real estate in Crystal Falls should expect the utmost in home craftsmanship, curb and price appeal.